Ndamukong Suh may have played his last game for the Detroit Lions only days before his biggest game for the Lions, and that pretty much tells us what kind of leader he is for the Lions. Suh's latest stomp, this time on the injured left calf of Green Bay Packers quarterback Aaron Rodgers on Sunday, has severely imperiled his team's playoff chances this Sunday in Dallas. The NFL suspended the star defensive tackle for one playoff game, claiming the "illegal contact, specifically the second step and push off with your left foot, clearly could have been avoided." Whether the stomp was intentional doesn't matter as much as the inarguable fact that yes, it could have been avoided. Suh could have made it look unintentional. He could have showed (or feigned) remorse when he realized what he'd done. Considering his history of sketchy tactics, he should have known better than to act so cavalier. He didn't care enough to act less careless. That may be the story of Suh's end in Detroit. The Lions' only other good season during the Suh era came in 2011, and then too Suh misbehaved in a crucial game against the Packers. Then too, Suh stomped on a Green Bay player – offensive lineman Evan Dietrich-Smith. And then too, the Lions suffered. Suh was suspended following his Thanksgiving Day incident and the season wasn't the same after that. The Lions went on the road in the playoffs and lost to the Saints. Considering Suh is likely gone (pending his appeal) against star running back DeMarco Murray this Sunday, the Lions might suffer the same fate: strong season, playoff whimper. Suh is one of the best players in the NFL, and that's beyond dispute. The Lions would not be a playoff team without him. And to his credit, he's gone his entire career maintaining a standard of conditioning excellence to match his on-field dominance. But Detroit has needed more than that from him. He was supposed to be a leader this season, a lieutenant in new coach Jim Caldwell's push to change locker-room culture and tamp down on-field shenanigans. For this entire season, he's done that. Now he's undone it. The Lions are now in a more precarious situation because of this, both on and off the field. On the field, they have to win without the one player who disrupts opposing offenses the most. Suh constantly draws double teams, which frees up the rest of the defensive line. Now, with Suh potentially out, the job of the three Pro Bowlers on the Cowboys' offensive line gets remarkably easier. So does Murray's job, and so does Tony Romo's job. After the season, a bigger headache for the Lions awaits: They have to decide whether to spend $26.7 million to franchise tag Suh and potentially keep him. He's the most valuable player on the roster, but what's to say he won't do this kind of thing again and again? Even if this was unintentional, he's an aggressive player with a history of questionable hits (and kicks). The league has already run out of patience with Suh, and won't give him the benefit of the doubt anymore. With this ruling, the NFL didn't list Suh's prior incidents; everyone already knows. So in a sport that's hyper-protective about its quarterbacks and player safety, it's unclear whether Suh is likely to be a 16-game player in the future despite his outstanding work ethic. Then there's the question about whether Suh really wants to be the kind of leader the Lions really need. At times, it's been hard to tell. He's as reluctant to deal with the media as Marshawn Lynch, leaving others to face tough questions after losses like Sunday's. He has skipped offseason workouts, which aren't crucial and yet build team unity. And even when teammate C.J. Mosley playfully joined in a Ford Field chant for him to stay in Detroit two Sundays ago, Suh didn't even crack a smile. Granted, none of these things add up to proof that he's unhappy in Detroit, but it's another dollop of doubt about whether the Lions can depend on him to maintain the right culture on the defense. The team probably has no choice but to do everything it can to keep him. 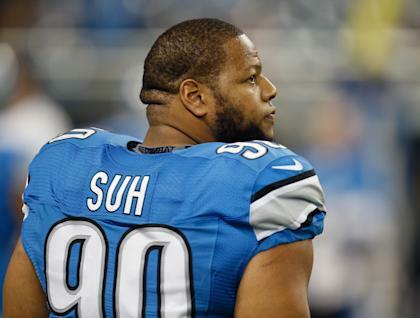 Suh is too important, too good. It just doesn't look like he'll ever heed any advice, from any coach. He's on an island of his own, which is fantastic in terms of his motivation to excel, but alarming when it comes to amending his questionable behavior. There is no sign he'll ever slow down in his play, but also no sign he'll never slow down in his methods. In a way, the questions about Suh's future are the same questions asked about his latest transgression: Does he care enough about doing the right thing? And if he did, wouldn't he have done the right thing on Sunday, when it mattered most?